Beauty, symmetry and functionality are first impressions your patients receive that can visually define your practice. Let us help you create a look and feel that accentuates efficiency and comfort, instills patient confidence, and speak volumes about the success of your practice. ILS has been designing innovative cabinetry solutions for orthodontic practices throughout the United States and Canada for more than 25 years. Our reputation has been built upon our unique ability to meet every cabinet need in the orthodontic office. Sometimes that can be achieved with standard modular cabinetry but often the practice is better served when we tailor our standard units to meet the functionality requirements of the practice. 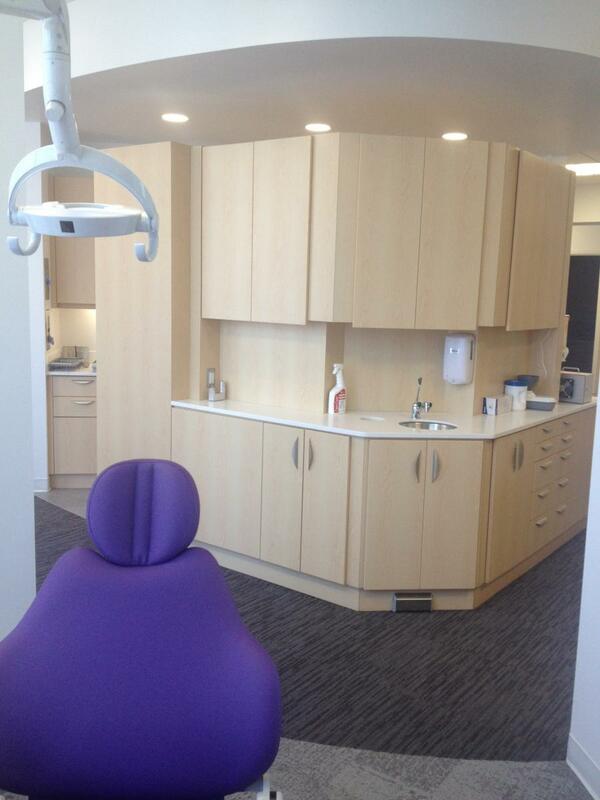 ILS will completely custom design all of the cabinetry in every room from start to finish for Orthodontist with a unique vision for their practice. In fact, more than half of the orthodontic offices we complete each year involve some element of custom design. Our specialty is innovative esthetic design. Mobile & Fixed Base Cabinets: (the standard in most orthodontic practices) Offering several configurations with features that include computer solutions with storage drawers, slide-out keyboard shelves and monitor mounts, and 2-handpiece manual delivery units or 2- 3-handpiece automatic delivery units. Options: water bottle system, fiber optic system, HVE SVE, vacuum canister and custom configurations to fit any need. Orthodontic Round Island: – Upper Tower includes provisions for two flat screen monitors, wall-mounted keyboard arms, upper storage cabinet with towel and glove dispenser, and center column providing easy access to wiring. – Base Cabinet includes round-face sink cabinets, 13″ round stainless steel sinks with single lever faucet, with 36 qt. container below. Separate base with metal leveling feet. Orthodontic 5 Bay Island: Five-drawer cabinets, 30″ lazy Susan, Metabox drawer system, provisions for five delivery units, and easy-access removable panels for delivery unit utilities hook-up. Available in 2- or 3- handpiece panel-mounted delivery units. Separate base with metal leveling feet. Orthodontic 4 Bay Island: Four banks of five-drawer cabinets, upper pass-thru tray and storage cabinets, pass-thru space at midsection, and provisions for four delivery units with convenience outlets at each station. Stainless steel sinks with gooseneck faucets, cup and towel dispenser, dispenser for 3 different glove types at each sink, and stainless steel waste drops at each station. Separate base with metal leveling feet. Brushing Stations: Offering double or triple bowl stations, stainless steel sinks with single lever faucets and chrome strainer, waste drops with waste container at each sink, and optional toothbrush holder mounted into countertop. Curved-base end unit for additional storage included in the three-tier station. Separate base with metal leveling feet. Ortho Cabinets: Several configurations available that include Metabox drawer system, access doors, and control panel mount. Stainless steel 9″ round sink is standard.